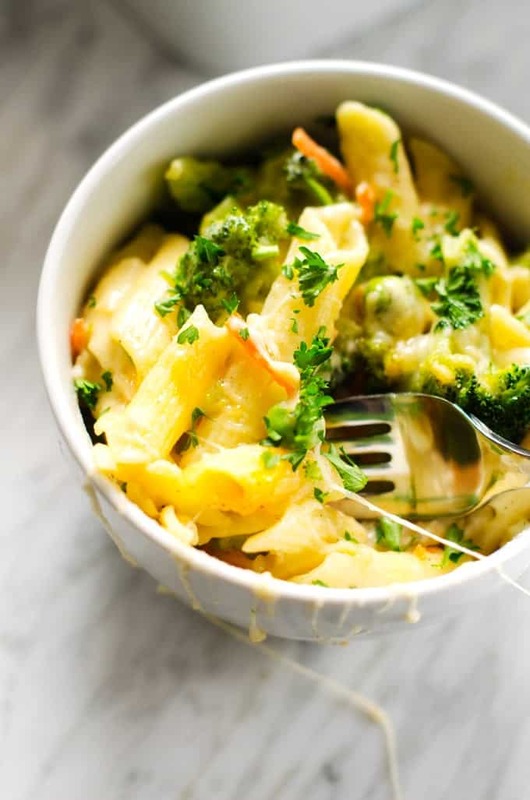 This Ultimate Veggie Mac n Cheese is a delicious way to get your kids eating more vegetables! Cheesy, creamy, and so delicious. Resistance is futile! 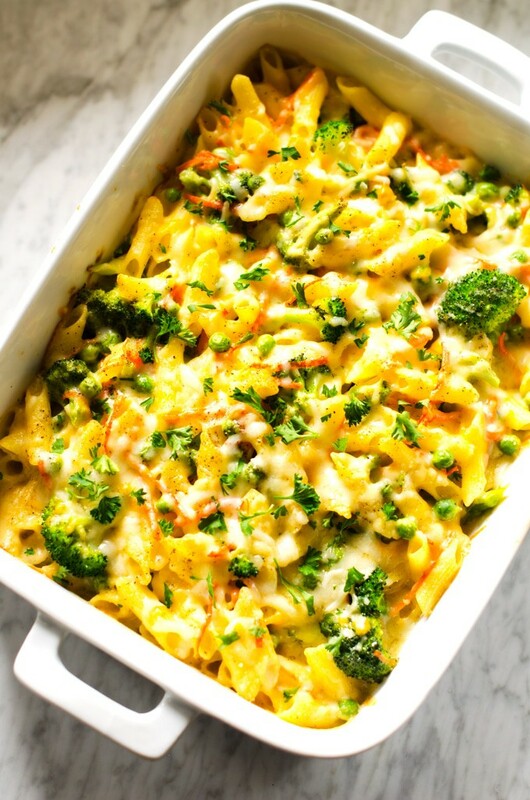 This Veggie Mac and Cheese is the perfect casserole for Meatless Monday! Mac and Cheese was a staple in our house when I was a kid, but I was an adult before I ever tasted homemade Mac n Cheese. Like a lot of kids from the ’70s, Mac and Cheese was a staple in my diet growing up. 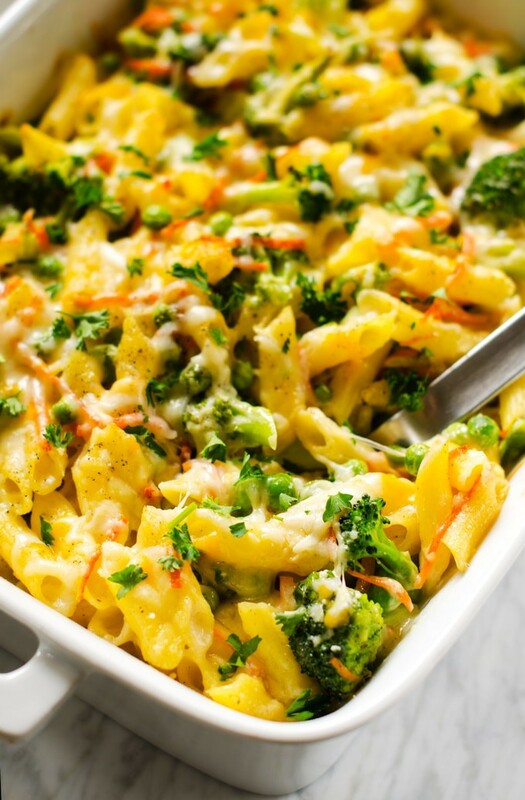 Now we aren’t talking something like this Veggie Mac and Cheese. We are talking about the one that comes in a box with powdered cheese. My sister and I use to argue about the best way to make it. 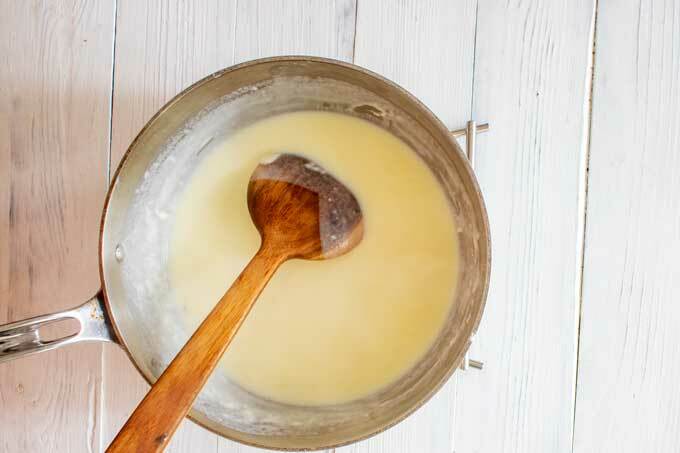 Should you melt the butter and then add the milk and sauce mix, or should everything go into the pot at once? It wasn’t until I was grown and learned to cook on my own that I ever tasted homemade Mac and Cheese. That moment began a love affair that will last a lifetime. Over time, my palate has evolved, and I prefer getting a bit more adventurous in the kitchen. Though my traditional Mac n Cheese is great comfort food, I much prefer today’s Ultimate Veggie Mac n Cheese. It just feels better to add a little veggies to an otherwise decadent dish! 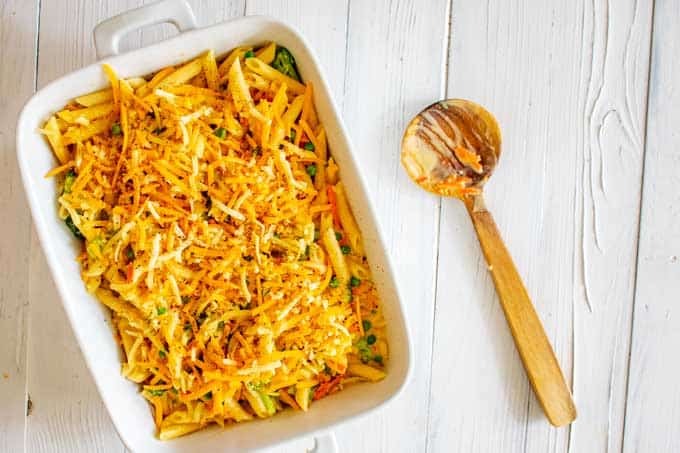 Made with gluten free penne, sharp cheddar, fresh spring vegetables and a hint of cayenne, this is Mac n Cheese all grown up! Preheat oven to 350 degrees. Spray a 13 x 9 casserole dish with cooking spray. Gather your ingredients and measure. Cook pasta according to package directions, adding in the vegetables in the last two minutes. Drain and rinse. Add flour, and whisk for 2 minutes, until golden brown. Add in the milk and cook, stirring often, for about 8 minutes, or until slightly thickened. Add in all but 1/2 cup of the cheese, mustard powder, sea salt, pepper, and cayenne pepper. Cook over low until the cheese melts. 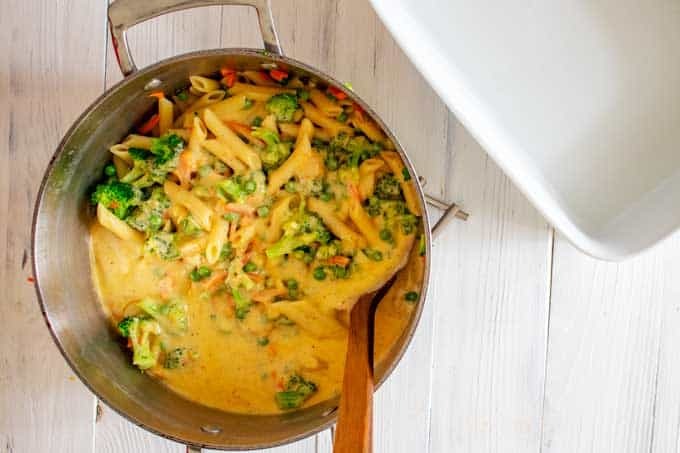 Toss the pasta and veggies with the cheese sauce. Transfer to a casserole dish. Top with the remaining cheese. Bake for 25 minutes. What veggies go with mac and cheese? 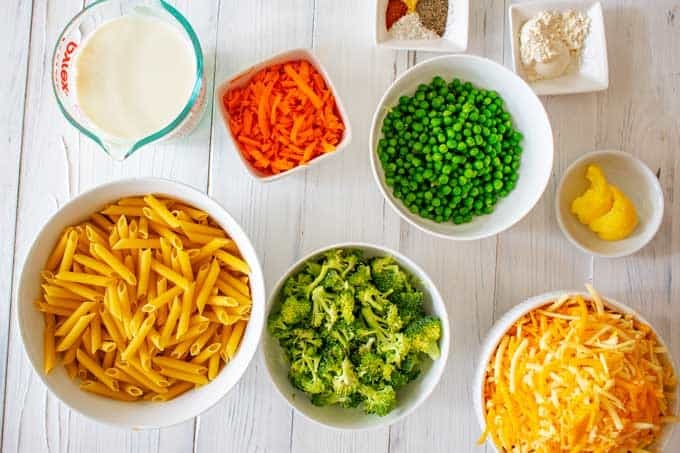 Shredded carrots, baby peas, broccoli, diced tomatoes, and sauteed spinach are all great options for adding to this recipe. Feel free to substitute whatever you have on hand. What are the best cheeses for Mac and Cheese? You can use a wide variety of cheeses, and even use your own blend to create a more complex flavor profile. Good options include cheddar, Colby, Gruyere, Swiss, fontina, Gouda, and goat cheese. Smoked cheeses can make for especially interesting flavors. 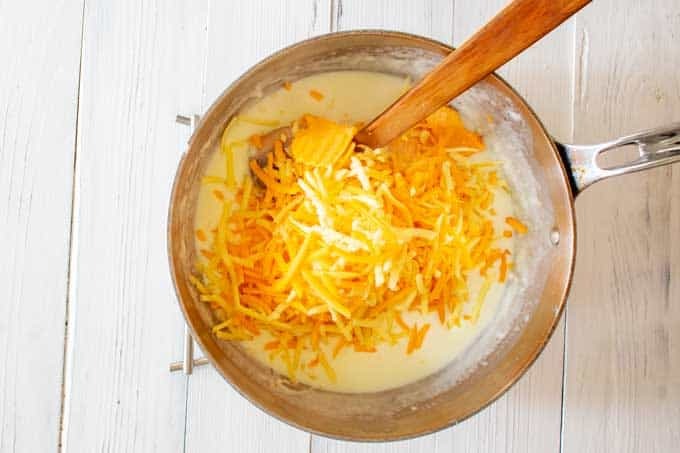 Make sure that your heat is not too high when you add the cheese. This can cause your sauce to break. This dish can be prepared up to a day ahead of time and baked when you are ready to serve. Alternatively, you can make this completely ahead of time and reheat. You may wish to add a bit of butter or milk when reheating. Leftovers will last in the refrigerator for up to three days. You may freeze this for up to 3 months. 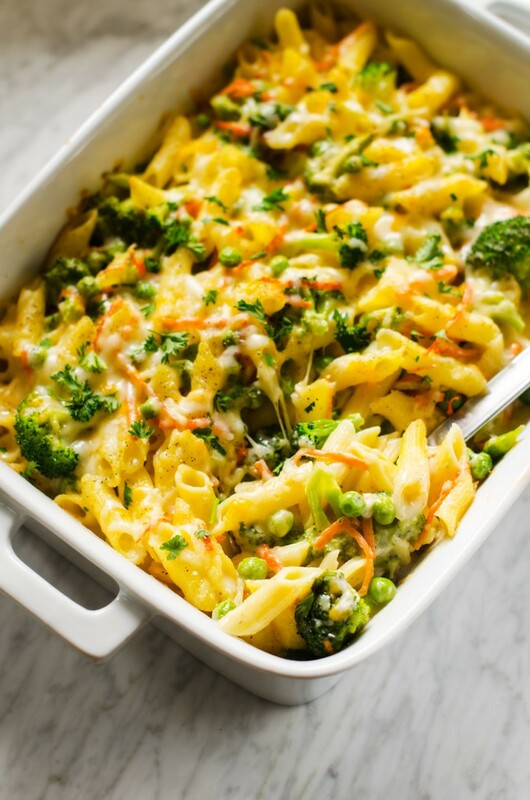 This Ultimate Veggie Mac n Cheese is a delicious way to get your kids eating more vegetables! Preheat oven to 350 degrees. Spray a 13 x 9 casserole dish with cooking spray. 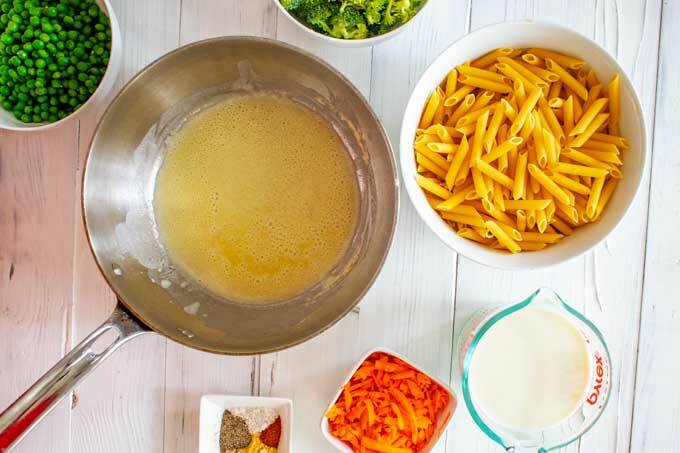 Cook pasta according to package directions, adding vegetables in the last two minutes. Drain and rinse with cool water. Meanwhile, make sauce by melting butter in a saucepan over medium heat. Add milk and cook until slightly thickened, about 8 minutes, stirring often. Add all but 1/2 cup cheese, mustard powder, salt, pepper and cayenne. Cook over low heat until cheese melts. 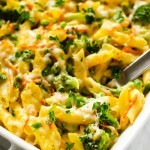 Toss pasta and veggies with cheese sauce and place in a casserole dish. Top with remaining cheese. I’d like to try their cheese in a quiche. What is Roth Ultimate Mac & Cheese? I saute some vegetables, especially onions, mushrooms and peppers, and them into the finished mac and cheese. I also add frozen peas when the pasta is almost finished cooking. I don’t drink milk so I don’t have it in the house. In university, I tried yoghurt, instead. Now I always make it that way.